I hardly ever get asked for a kitchen design board, so when I do it's really fun :) This is your typical mini kitchen makeover.. keeping (but painting) the existing cabinets and replacing the countertops, backsplash, etc. Black granite, butcher block island, subway tile backsplash with gray grout. Simple, inexpensive, classic. That backsplash is gorgeous! I'm sure even more so in person! We just did a mini makeover to our kitchen. Paint, pulls, backsplash, faucet. What a huge difference little tweaks can make! It's going to be an awesome transformation. Love how classic it is. The herringbone tile is amazing. Wonder where it's going? I am planning on using the Mandala tile on my backsplah in my wet bar area... I love it. I think I might go funky (for me) and do the herringbone pattern. Beautiful job! Love all your picks. Love your future kitchen! 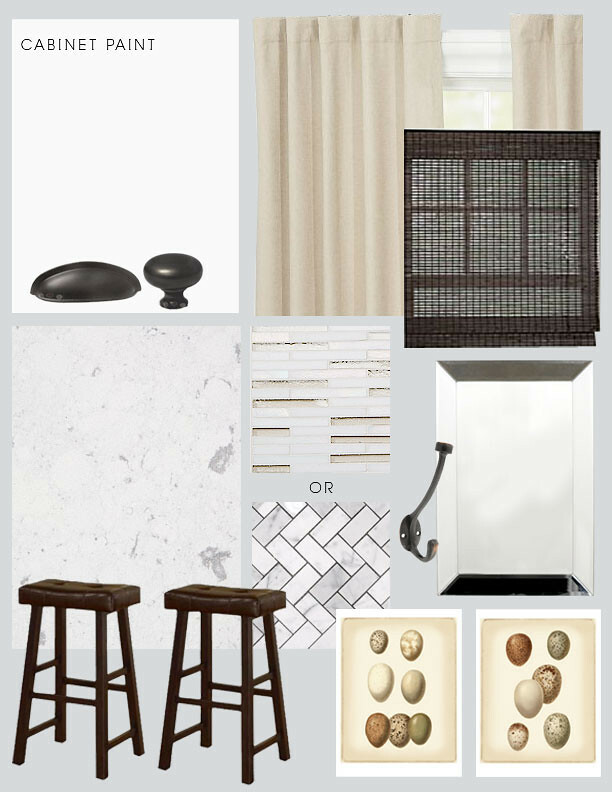 Just what I want too...maybe with marble subway tile backsplash but it's pretty much the jist! Ahh someday! Beautiful design, Bryn!! We gutted our kitchen about a year ago, and now we're moving!! I have a feeling that in our next home we will do a mini-renovation. Love your picks! Oooh, I hope you get to do more kitchens, I like it- a lot! I cannot wait to do a white kitchen one day-- love your inspiration! Love a mix of counter-tops in a kitchen! Wood and stone is a great mix. Love-Love- LOVE it! Yes, this will be just as beautiful 20 years from now. The addition of the butcher block is genious! love that backsplash tile, bryn! I love it when the island has a different top. The butcher block adds so much warmth! I love a classic look too and especially love the dark floors with the white cabinetry. Thank you so much for the wonderful review! Keep Sharing More..